TURQUIE – – Gallipoli - Roman relics and many other hidden artefacts have been found during a pain-staking survey of the Gallipoli battlefields. The joint historical and archaeological search of the site by Australian, Turkish and New Zealand government-backed teams is using GPS and ground-penetrating radar - as well as old-fashioned field work - to fill some of the gaps in the story of the disastrous 1915 military campaign that forged a young nation's identity. The 16-person team, which includes 10 Australians, five Turks and a New Zealander, is in its third year of the survey. 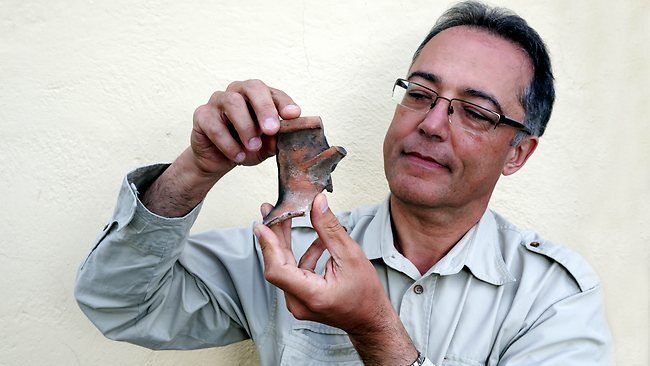 Lead scientist and University of Melbourne Professor of Archeology Tony Sagona has been tracing the network of trenches, dugouts and tunnels. He was particularly pleased to find Roman artefacts at Lone Pine dating from about 200 AD. "The Roman material is very significant because it shows the longevity of occupation of the site," Professor Sagona said. "There are some impressive finds." This year's haul is the biggest yet with more than 450 items handed to a Turkish naval museum at Canakkale. It includes an Ottoman bayonet handle and its blade, the base of a 10cm shell casing from a navy gun, barbed wire, bullets and bully beef tins. FRANCE – Angers - La place du Ralliement, la clinique Saint-Louis et plus récemment le projet Gare+ l’ont prouvé si besoin était : le sous-sol d’Angers regorge de richesses archéologiques qui font le bonheur des spécialistes. « Les découvertes archéologiques peuvent être passionnantes, mais elles contrarient les grands projets, c’est agaçant » constatait d’un ton acerbe Jean-Claude Antonini, le président d’Angers Loire Métropole. Les sondages réalisés par l’Institut national de recherche préventive (Inrap) au printemps 2011, ont mis en évidence la présence d’une vaste nécropole s’étalant sur plusieurs siècles. Il a donc fallu trouver une solution pour préserver ce site rare. Plutôt que de s’appuyer sur des fondations classiques, qui auraient abrité un parking souterrain, l’établissement 3 étoiles sera monté sur des pieux de 50 cm de diamètre cachés sous un socle engazonné. Ce compromis doit permettre de préserver les vestiges enfouis à faible profondeur (80 cm) sans retarder la réalisation des travaux. « C’est comme si on mettait la nécropole sous cloche, résume Daniel Loiseau, vice-président de l’agglo en charge du développement économique. On pourra lancer la construction tout en préservant la possibilité de creuser à long terme. » « C’est une destruction mineure qui n’altèrera pas le site au point qu’il sera perdu, ajoute Pierre Chevet, adjoint scientifique et technique pour la région Pays de Loire à l’Inrap. Il faut bien voir que des fouilles détruisent un site. Là, l’Etat a fait le choix de la préservation. » Le caractère exceptionnel du site, qui réunit une nécropole antique et un cimetière du XIXe siècle, ne fait en effet aucun doute. Au total, ce sont plus de 20 000 tombes qui seraient enfouies sur quatre à cinq niveaux et un hectare et demi de terrain, selon l’anthropologue Elodie Cabot. D’ailleurs une autre portion du site, fouillée elle au tournant des années 2000 lors des travaux du premier parking Saint-Laud avait permis des découvertes inédites, riches d’enseignements : « le plus grand groupe de Germains orientaux, vulgairement appelés Goths, originaires de l’actuelle Crimée, et de précieux artefacts datant du IVe siècle » détaille l’archéologue Jean Brodeur. Notamment des céramiques caractéristiques et de très rares fibules : « On a treize au niveau national, dont huit trouvées sur le seul site d’Angers. » Pour fouiller ce site, estime-t-il, il faudrait compter deux ans et prévoir une solide équipe (une cinquantaine de personnes). Si l’on extrapole à partir d’un autre chantier de grande ampleur, celui de la clinique Saint-Louis, on peut estimer le coût de ces fouilles à plus de 10 millions d’euros. BULGARIE – Perperikon - Archaeologists have found more gold and silver coins at the holy rock city of Perperikon, belonging to the largest ever medieval coin treasure in the country. 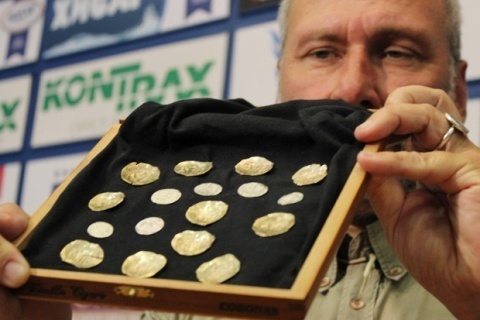 In mid-August, leading Bulgarian archaeologist, Prof. Nikolay Ovcharov, made the announcement about this coin treasure, after his team discovered a total 11 gold and 6 silver coins. The gold coins are from the 14th century while the silver ones are from the end of the 13th century. The coins have been found dispersed in what has been used as a toilet hole with a 2-meter diameter, leading the experts to believe that they were hidden and buried during the Ottoman invasion of the area. Such treasures were usually placed in clay pots or similar vessels and then concealed, while for the latest find it is believed that the coins were put in some sort of a purse, which has decomposed over the years.The coins were discovered in the central town of Perperikon, near the Citadel, in the area believed to have been the residence of the very wealthy Byzantine bishops. The expectations are to locate more than 50 other gold coins. The archaeological season at Perperikon has concluded with researchers saying they have found new evidence that this was the place of the mythical shrine of Dionysus. During the last days of excavations, they also unearthed a clay altar, with a 2-meter diameter, used for religious rites. The unique Ancient Thracian city of Perperikon was first discovered in 1979 in the Eastern Rhodoppe Mountains. It is thought that the famous sanctuary and oracular shrine dedicated to Dionysus of the Bessi tribe was situated there. 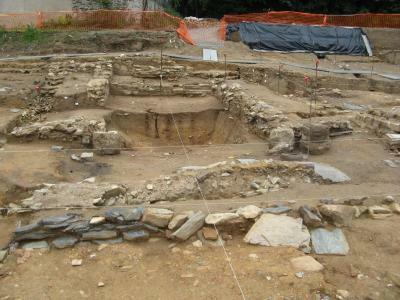 The ancient rock city contains remains from all archaeological periods.Ovcharov also discovered nearby an ancient Thracian surface tomb in the village of Tatul, containing a sanctuary linked with the cult of Orpheus. 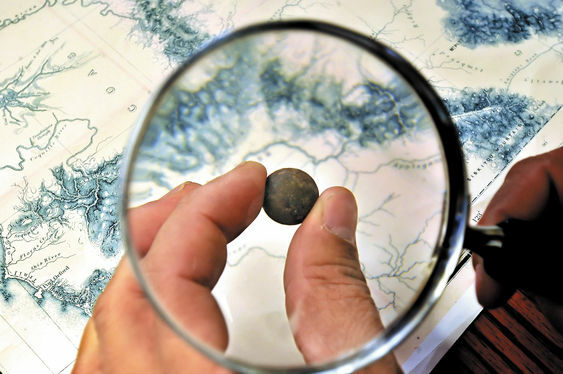 USA – Hungry Hill - Archaeologists and volunteers have found musket balls and other artifacts confirming the site of the biggest battle of the Rogue River Indian Wars nearly 150 years ago. Southern Oregon University announced that the site of the 1855 Battle of Hungry Hill is on federal land west of Interstate 5 in Southern Oregon between Glendale and Sunny Valley. After fleeing an attack by Jacksonville miners on their Table Rock Reservation outside Gold Hill, a band of about 200 American Indians fought off about 300 soldiers and militia members over several days in October 1855. A few months later, the wars ended when the Indians were forced to move hundreds of miles from their home to the Grand Ronde and Siletz reservations. In recent weeks, a team of searchers tramped the Grave Creek Hills west of the old Applegate Trail, now Interstate 5. They looked at two other likely sites and found no artifacts. At the third site, they found two unfired .69 caliber musket balls, which would fit the 1842 Springfield musketoon issued to Army dragoons at the time, and a lead stopper from a gunpowder flask. The artifacts matched similar items found at Fort Lane outside Gold Hill. SLOVENIE - Ljubljana - - The Roman Wall, the Emonan House and the Early Christian Centre will officially open in Ljubljana on Friday as renovated archaeological parks which will take visitors back to the times of the Roman settlement of Emona.